Home entertainment news How role models Lupita Nyong'o boost academic performance in schools. How role models Lupita Nyong'o boost academic performance in schools. Rarely do teachers and parents in Kenya consider low educational aspirations as a drawback to students’ learning outcomes in arid areas, urban slums and other pockets of extreme poverty. The issue is those students’ aspirations and sense to succeed through education is brow-beaten by the very difficult nature of living in poverty. However, new evidence suggest that students’ aspirations and impact on educational achievement could be increased by intervention of role models featured in video or in full-fledged feature films. 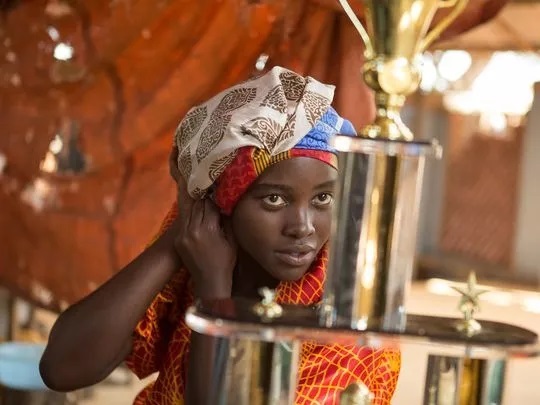 One such a film accredited to increasing students’ aspirations in Uganda is the movie, Queen of Katwe, a film starring Lupita Nyong’o as Nakku Harriet, the mother of Phiona Mutesi, the girl from the slums of Kampala who beat the odds to become an international chess champion. In reality, Phiona has represented Uganda three times in Chess Olympiad and this year, she joined Washington’s Northwest University. For a girl who sold roasted and boiled maize in Kampala’s slum alleys, this is not a small feat. In a nutshell, the screenplay is about a poor girl who dreamt of becoming a chess grandmaster and almost made it. Queen of Katwe may not compete with some of Disney’s popular hero blockbusters such as Batman, Hercules, The Lion King and Spiderman in terms of viewership. But it has presented a powerful role model that can change lives, not just in Uganda but in other parts of sub-Saharan Africa where students can identify themselves with Phiona. According to a study conducted by Emma Riley, a doctoral candidate at the Department of Economics at University of Oxford, students who watched Queen of Katwe just before they sat Mathematics papers in Form Four and Six national examinations performed better than their peers who had watched Miss Peregrine’s Home for Peculiar Children. “The use of a placebo movie allowed me to exclude any beneficial effect to aspirations and examination performance from the novelty of going to the cinema and media exposure in general,” says Riley. In the study, “Increasing Students’ Aspirations: The Impact of Queen of Katwe on Students’ Educational Attainment,” recently published by Oxford’s Centre for the Study of African Economies, Riley found that watching an aspirational film, with a potential role model, has capacity to increase performance in mathematics among Form Four students in Uganda. In fact, the increase was even much higher among Form Six students. According to Riley, the higher examination performance among the students who had watched Queen of Katwe was driven by imitation of Phiona’s positive academic behavior. Although in her life, Phiona had dropped out of school, she later got back and in 2010 at the age of 16, she sat for Uganda’s Primary Leaving Examination and joined secondary school. She continued to play chess at international level. Riley argues that it is under this background that students who watched Queen of Katwe increased their academic aspirations by raising their beliefs over what goals are possible for them to achieve if they imitated Phiona. Interestingly, the Queen of Katwe effect was increasingly felt by lowest ability students at lower ranked secondary schools, a factor that amplified the power of imitation of role models. Nevertheless the study, which is the first of its kind in East Africa, highlights the power of a role model as a cost-effective way to improve secondary school students’ educational attainment, particularly the worst performing. In varied circumstances, the success story of Phiona is similar to that of Legson Kayira, the late novelist who at the age of 16 walked barefoot over 2,500 miles from his rural village in northern Malawi to Sudan. In his first novel and autography, I Will Try, Kayira narrates how in 1958 he embarked on the long journey to Khartoum to get a United States visa so that he could join a university. In his own words, Kayira says: “While in Khartoum, American consular officials helped me to travel to the US to take up a scholarship at Skagit Valley College. American officials were amazed by Kayira’s feat. Since then, he has remained an inspirational role model to many students not just in Malawi but in other parts of the world. But the issue is that while there is no need to emulate Kayira today in walking long distance on foot in search of a university degree, challenges still exist even at the village level, where so many children from poor households continue to struggle in order to succeed through education. Borrowing heavily from Kayira’s secondary school’s motto, I Will Try, and which he used as the title of his first book, one wonders whether teachers and parents in Kenya and elsewhere in sub-Saharan Africa try hard to pinpoint role models who could be imitated by students. Although Phionas and Kayiras of this world might be too few or far between, that is not to say that there are no potential role models who could raise students’ academic aspirations. Ideally, schools could use local individuals to tell their successful stories but avoid make-believe celebrities and others who could mislead students with unproven short-cuts to success. Schools could also use videos and films of persons that students could readily identify with, as there is evidence that people receive messages better from those they recognise as similar to them. According to social cognitive theory, attitudes and behaviour are strongly influenced by the experience of others in one’s immediate environment. But too often, teachers present role models that are far too removed even from the students’ imaginable reality. For instance, it would be futile to try raising academic aspirations by showing videos on life and times of the likes of Nyerere, Mandela, Wangari Mathaai and Obama to students in failing schools. Nevertheless, some parents in Kenya have tried to raise their children’s academic inspirations by telling them regularly how they could become top-notch doctors, engineers, mathematicians, pilots or computer scientists, even when attending schools without core textbooks libraries, laboratories and other basic learning facilities. Unfortunately, when the bar to success or that of the role model is set too high, students’ academic aspirations are likely to suffer. In this regard, students in Riley’s sample showed progress in increasing academic aspirations because their exposure to Phiona as a role model became a substitute to their experience of actual peers and in this case helped to promote behaviour change. No doubt Riley’s study should be a pointer to teachers and parents that while identifying role models to boost students’ academic aspirations, simplicity, modesty and familiarity should be hallmarks of selection criteria.